This turn-of-the-century Neoclassical house in historic Mayesville was built in 1907 for H.C. Bland. A talented landscape artist, Bland later moved to Sumter and established Swan Lake Iris Gardens in 1927. He left behind the stately home known for its Corinthian columns and lush gardens, which was bought by P.M. Tiller. Under Tiller’s ownership, the home underwent significant changes. Over the following years the side porches were enclosed, decorative shutters were removed, the exterior was covered with aluminum siding, and Bland’s gardens became untended. The home sat empty for five years beginning in 1980. The Tillers’ son and daughter-in-law eventually acquired the home and in 1985 began restoration efforts. The younger Tillers discovered original spindles and shutters in a storage shed behind the house and incorporated them into the project. They restored the porches, removed the aluminum siding to reveal a decorative attic windows, added bathrooms (the home originally had only one), and rehabilitated the garden. Much of the renovation was modeled after old photos of the home shortly after it was completed. Today the home stands once again as the jewel of Mayesville and a testament to the vision of H.C. Bland. 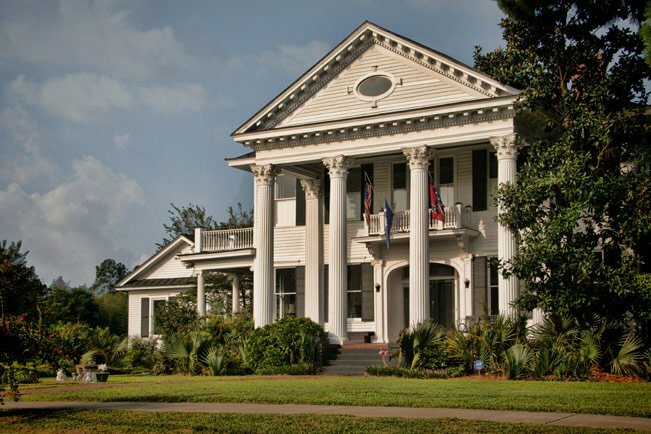 The Mayesville Historic District is notable for its representation of the cultural, commercial, and architectural development of a small nineteenth century South Carolina community. The district, which encompasses the western half of the town, contains a concentration of eighty properties that represent a broad range of late nineteenth and early twentieth century vernacular architectural design, including commercial, residential (majority), and religious examples. Architectural styles include Neo-Classical, Victorian, Queen Anne, Colonial Revival, Commercial, and Bungalow. The visual appearance of the district reflects the evolution of this small rural town that developed as the result of the changing economic forces brought about by the establishment of rail transportation and subsequent commercialization in the late 1800s. Unfortunately, since its nomination many properties have been demolished or altered significantly.